Fifteen people still missing and 38 confirmed dead after ship capsizes off city of Ormoc. Thirty-eight people have been confirmed dead and 15 people are still missing after a ferry sank in the central Philippines, the coastguard said. 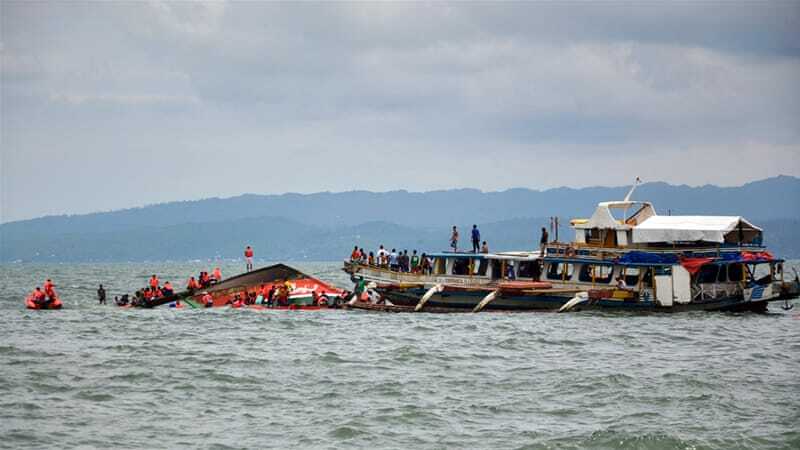 The vessel carrying 187 passengers and crew overturned in rough waters minutes after leaving the port of Ormoc City on Thursday headed for the islands of Camotes east of Cebu. Search and rescue operations continued through the night, with coast guard personnel reinforced by a Philippine navy ship and two air force planes. Divers were to search waters for those still missing on friday. A preliminary investigation of the accident pointed to human error after the wooden hulled ferry made a sharp right turn soon after it left port. Panicked passengers crowded the right side of the ferry, causing it to tilt slowly before capsizing, coast guard spokesman Armand Balilo told local radio. "The ferry was carrying cement and rice but it didn't appear to be overloaded," Balilo said. Poorly maintained, loosely regulated ferries are the backbone of maritime travel in the Philippines. Last September, at least three people died and more than 100 people were rescued after a ferry sank in waters off Panaon Island in the Southern Leyte province after it was hit by huge waves during bad weather. In August 2013, at least 114 people died after the MV St Thomas Aquinas sank after colliding with a cargo ship as it headed to Cebu.